From the flexibility of our "PM+" preventive maintenance program, to complete turn-key "one-stop shopping" comprehensive guaranteed contract maintenance program, to captive shop solutions, Hogan offers a wide array of options customized to meet our customer's unique needs. From continuous training to state-of-the-art diagnostic equipment, Hogan knows how to effectively manage a transportation fleet. Our customers leverage our fleet management knowledge & expertise, allowing you to focus on your core competency. At Hogan, we know that there's much more to a fleet maintenance program than just servicing your trucks. Our incredible customer loyalty is a result of providing our clients with superior overall service. We know your transportation fleet can be a key factor in how you service your own customers. We partner with our customers to improve efficiencies & drive down costs, and are committed to going the extra mile to ensure your satisfaction. 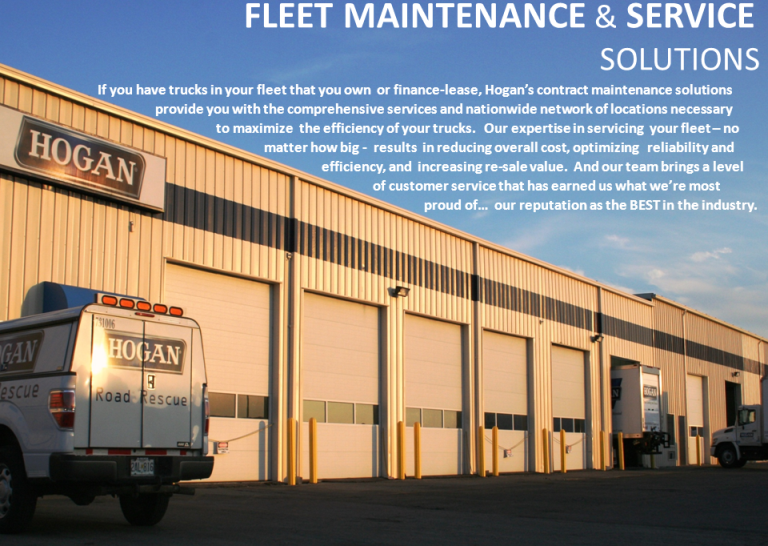 Hogan's fleet maintenance solutions ensure that your transportation fleet is truly an asset to your business.